We Guarantee best location in Seoul Hongdae. Grape Garden House is near everything you need handy. It may be difficult to find a specific address in Korea. Therefore, please read the directions to Grape Garden House below. ‘Haute eye glasses’ and ‘C&U convenience store’ on your right side. 4. walk forward a few steps and you’ll see the ‘7-eleven’convenience store & Churros101 on your left, make a left turn. 5. walk around 100 meters the Fashion street. 6. Turn right when you get to the ‘A’ clothing store, ‘7-eleven’ and just few steps, you can see Grape Garden House. 2. Get off at ‘HongIk Univ. station. The bus ride takes about 40mins. 3. The bus stop at Hongik University station is in the middle of a road. 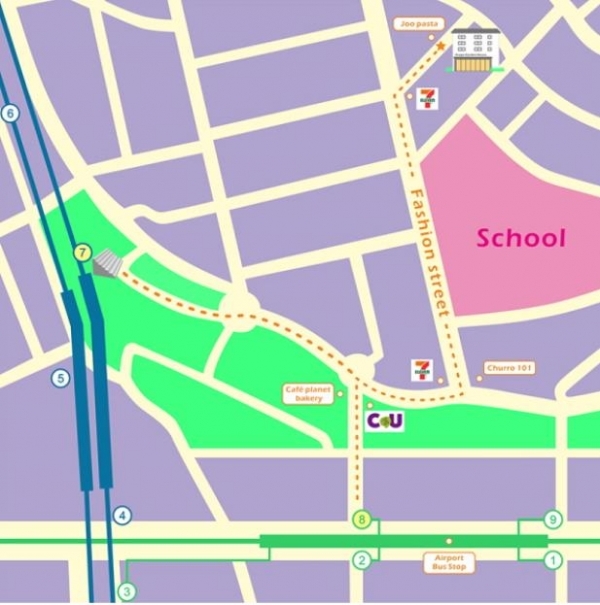 When you exit the bus, cross the street towards Hongik Univ station. Exit #8. 4. Turn right directly past the subway entrance and walk 40meters to the ‘Haute eye glasses’ and C&U convenience store on your right side. 5. Turn right at the C&U and walk a few steps and you’ll see the ‘7-eleven’ and ‘Churro101′ on your left. 7. walk around 100 meters the Fashion street. 8. Turn right when you get to the ‘A clothing store, ‘7-eleven’ and just few steps, you can see Grape Garden House. 1. Exit #8 and turn right and walk 40meters to the ‘Haute eye glasses’ and C&U convenience store on your right side. 2. Turn right at the C&U and walk a few steps and you’ll see the ‘7-eleven’ and Churro101 on your left. 4. walk around 100 meters the Fashion street. 5. Turn right when you get to the ‘A’ clothing store, ‘7-eleven’ and just few steps, you can see Grape Garden House. 2. Get off at ‘Hongik Univ. station. ‘Haute eye glasses’ and ‘C&U’ convenience store on your right side. 4. walk forward a few steps and you’ll see the ‘7-eleven’ & ‘Churros101′ on your left, make a left turn.